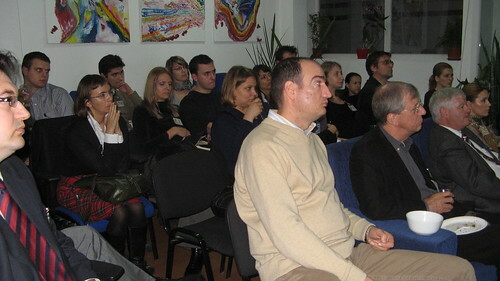 SPA INOVATIONS, active supporter of the RoGBC participated in the “Passive House” Competition organized in Bulgaria. The first question mark in elaborating the project was: who lives in this house and what will the owner is going to use it for. The needed spaces being already given, our team decided this will be a dwelling house for a maximum four persons. A vegeration area, measuring 10 sqm will host all the systems needed for this house, such as heating, water, air and electricity systems. 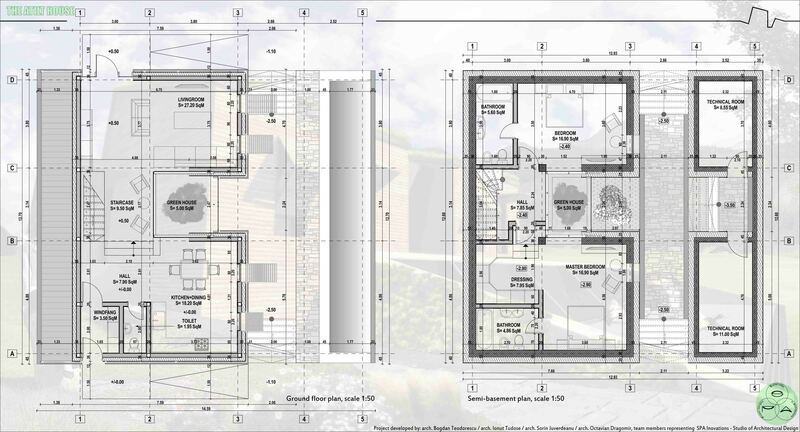 This part of the house will also be at the semi-basement level, gaining a more clear view of the site, and also phonic isolation, being desired to exclude most of the systems outside of the house. 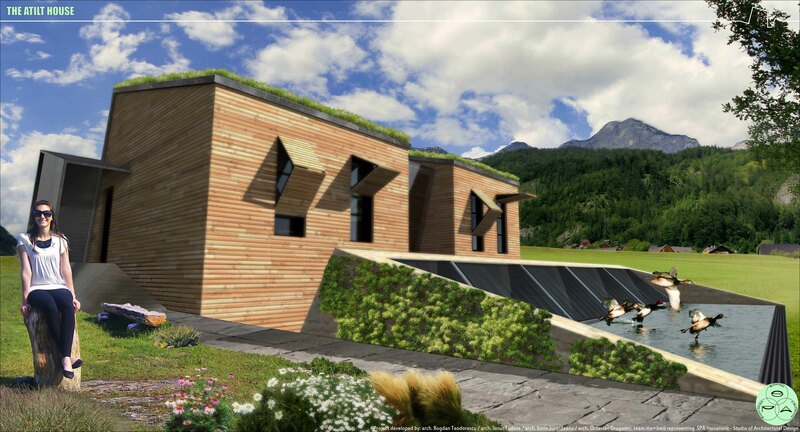 The volume is to be raised following the idea to create an efficient natural resource gathering house. The resources we had in mind are: the sun energy, the rain water and earth’s characteristics for phonic and thermal isolation. 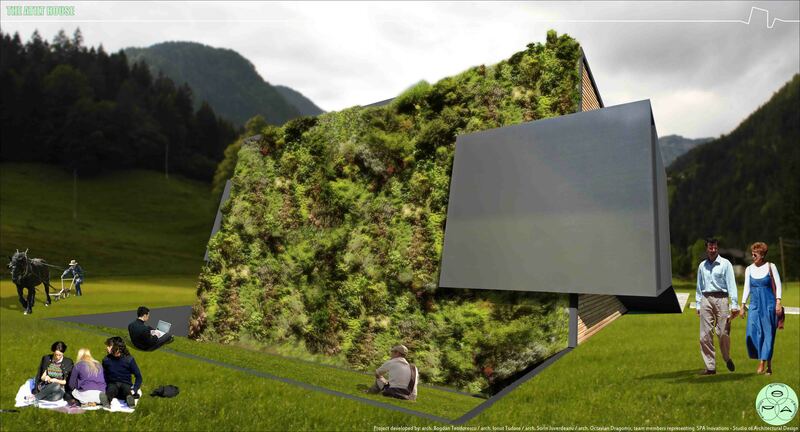 Harvesting the sun energy means to create a volume that can make good use of the sun light during the day, using not only photovoltaic panels, but also letting the sun heat the house by using windows and the greenhouse effect. This aspect will be helped by creating a rectangular cutting in the basic volume for better harvesting of the sun light. Shades are to be considered in this aspect, to prevent the overheating. The rain water collecting criteria implies atilt planes and retention systems. The planes are to conduct the water to a desired route, protecting the house from strong winds, winds that can supplement the water quantity on a atilt plane with a retention system. Exploiting the earth’s characteristics concludes to build part of the house under the earth’s level. Concluding the architecture and the volume aspects, following at each step the positioning criteria, we decided that the house will be placed on the site with access from the west, green facade on the north, yard access on the east and glass and shades facade on the south. On the northern limit it is desired to place a layer of high vegetation (trees) to create better protection for the the house ant its atilt planes. Also the building will be placed near this limit to benefit from the sun light in the most part of the yard. The western part of the site will benefit from road access and parking lots. The vegetation used for the yard, other than the trees mentioned, is to be mainly low height vegetation, such us grass, shrubs, bushes, groves and climbing vegetation that will be present on the roof, eastern and western facades and in the underground court. 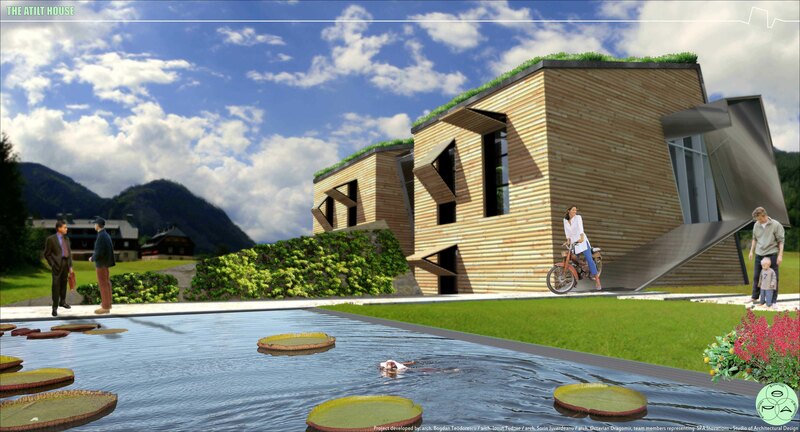 The location, in relations with the urban and natural context, represents a big hint for the material usage aspect. Engaging the question of material usage, the answer came from the location itself. The closest one was the earth found on the site. The earth will be excavated to build the semi-basement floor, to build the plant area, and to create an access for the rest of the yard and the plant area also. Part of this excavated earth it is to be used in the foundation and some at the roof, the choice for this house’s roof, being a green roof. At this point, it must be specified that the choice of the green roof implies also the use of recycled plastics and ceramics in the roof’s earth layer. This method helps the vegetation layer to gain stability. The type of vegetation used for The next identified material is wood. The site location is in a hill area where wood can be found as a local resource. Wood will be used to build the ground floor and the roof structure. Also from wood can be made a wool wood named heraklith, an efficient insulator and light partitioning material for the interiors. In the local resource category we include also the stone. Stone will be manufactured for the landscape design of the yard. The village being close to Sofia, the capital of Bulgaria, means quick access to the material manufacture industry and low cost transportation. The conclusion of this idea brings us to the rest of the needed materials such as concrete and reinforced concrete, a very durable material, used for the foundation and the semi-basement structure, stonewool insulation, cellulose insulation, made from recycled paper, a great airtight material, metallic elements used for the access boxes and and coatings and elastic membranes for wind and water protection. For electircity production, we propose using 20 photovoltaic panels, which can provide 40% of energy requirements of the building. Photovoltaics is a method of generating electrical power by converting solar radiation into direct current electricity direct current electricity using semiconductors that exhibit photovoltaic effect. The convertion is static, clean and eco-friendly. To increase production efficiency, we propose placing a surface of water adjacent to the panels to reflect sunlight. For artificial lighting we plan to use LED lighting bulbs and low-consuming electric fixtures and appliances, reducing the electricity consumption up to 80%. Heating and hot water will be ensured by a wood pallet stove, placed in the technical area for optimal distribution, and solar collectors.Wood pellets are a type of wood fuel, generally made from compacted sawdust or other wastes from sawmilling and other wood products manufacture. High-efficiency wood pellet stoves and boilers typically offer a combustion efficiencies of over 85%. Emissions such as CO2NOx, SOx and volatile organic compounds from pellet burning equipment are in general very low in comparison to other forms of combustion heating. For summer cooling and ventilation we will use the Air to air exchanger and Ground-to-water heat pump. The Ground to water Heat pump has extremely high efficiency: 60% of the energy required for heating comes from the natural environment due to factor COP 5 (5 kW of heat energy produced for 1 kW of electricity consumed). The heat pump produces up to 17kW and is combined with a Hydronic radiant floor heating system, a system of metal tubes laid within a floor that carries hot water into specific rooms, dispersing the heat through the floor surface. Hot water is provided with the aid of the heat pump and two solar collectors. 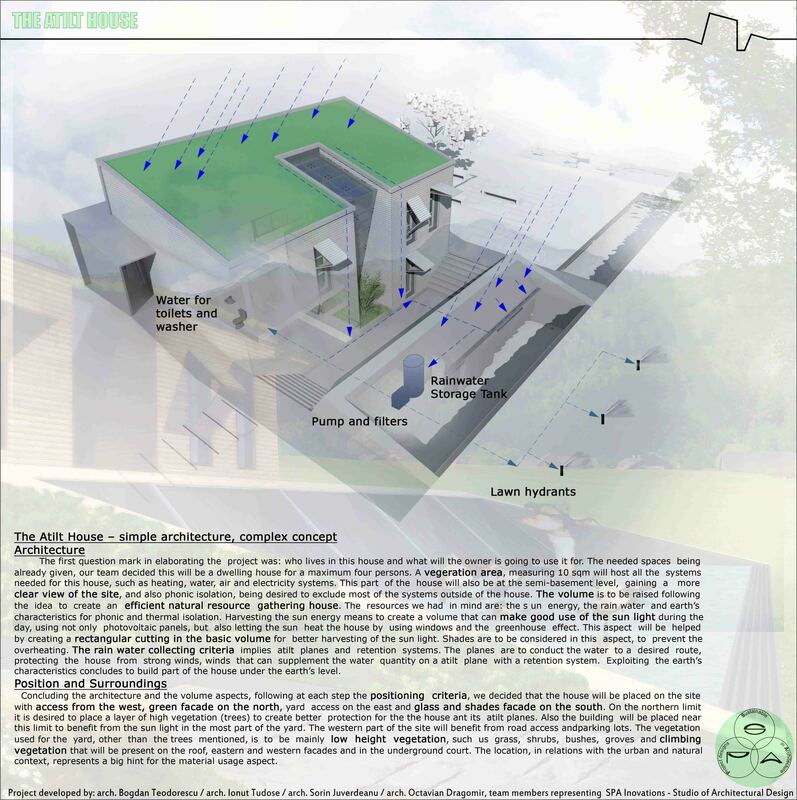 The Atilt House also makes use of rain water cisterns for irrigation of native landscaping and a vegetated roof for efficiently collecting and filtering rain water. Using rainwater for toilet flushing, clothes washing, bathing and showering make the biggest contribution to saving water. This means that the water levels in the rainwater tank will be regularly drawn down, allowing more rainfall to be captured and used. Natural daylighting is a very important aspect of its design concept. Window positioning play a critical role in passively heating the house. South facing windows along with the curtain wall warm thermal mass walls and floors affectively warming the house on a cold winter day. After the infrared rays from the sun touch any surface, these rays are absorbed and converted into long-wave thermal radiation which is incapable of escaping back through the glass. Indoor vegetation represents a natural bio-filter which is a component of the indoor air quality systems and is an element of the sustainable design strategy for the building. To remove the stale indoor air and replace it with fresh, clean air from outdoors we used an Air-to-Air Exchanger. The Air-to-air exchanger is an effective system that provides the necesary air change per hour of 0.5 without consuming large amounts of electricity. In addition to providing a consistent supply of fresh air, the Air-to-Air Exchanger can help significantly lower heating costs during the winter by transferring heat from the exhaust air to the fresh air stream. In the summer, it also reduces the load on the air conditioner by lowering the temperature of the fresh outdoor air. Through implementation of geothermal, photovoltaic, solar hot water, and advanced heat-recovery technologies this home has succeeded in reducing the energy consumption by more than 80% compared to a typical home construction, an annual heating and cooling requirement of 15 kWh/m2/year, an airtight building shell ( 0.5) and a thermal bridge free construction (0.01 W/mK). CONGRATULATION TO THE SPA INOVATIONS TEAM!